We have a culture of outsourcing our patenting. …. Ultimately balancing entertaining our kids and maintaining our own space and wellbeing. 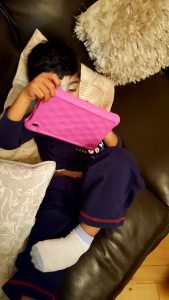 I saw the change in Yusuf’s behaviour when he was addicted to the iPad. We have had no iPad for 7 months and it’s bliss. Children become so obsessed they are unable to engage with their environment! But is it any different to being engrossed in a book?I think their is an element of personality trait and sadly this is the norm! 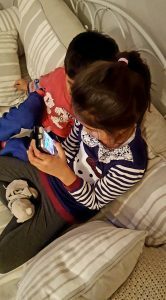 Thank you for your comments:) I do think screen time is particularly addictive and can create particular problems for kids and their parents alike. Good on you for having an iPad free zone now! Was there much resistance initially? So pleased it is working out well..
We have had a ‘child shall touch no gadget ‘ rule since the beginning for our 4.5 year old. And no more than 30 mins TV a day which started after he was 4. Previously it was rare. We are delighted by his sociability, he is bilingual and builds all manor of things from every day objects including houses with sticks and leaves. Loves books. Helps cook. He is happy laughing, talking and singing all day. I wouldn’t change that decision for the world. We never had technology growing up and didn’t struggle to pick it up. He will touch his first iPad when he goes to school in sept and it’s inevitable. But the early years has no need for it at all. Thank you so much for your comments. I think you have hit the nail on the head. Without iPads our children can be creative, resourceful, active and develop a whole range of social and emotional skills. Well done for sticking to your principles!